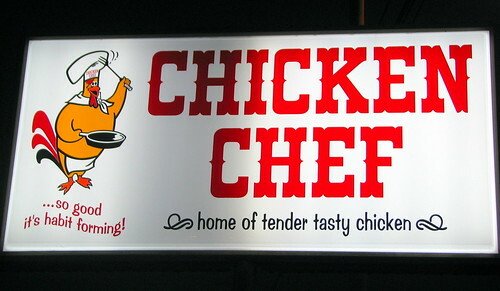 I first learned about Chicken Chef right before my first visit to McMinnville several years ago, but I didn't have a chance to stop there and check it out. From what I could tell, the place was so popular that more locations opened up, but the original spot was the only one popular enough to remain open. 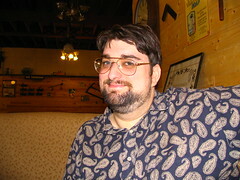 Reviewing restaurants isn't my thing, and I'm not much of a fried chicken eater either. Yet, when I'm on the road, I look for where the locals eat, and not the chains that I can find anywhere. It's a short order place, was filling, inexpensive, and they took a personal check, so all was fine with me. 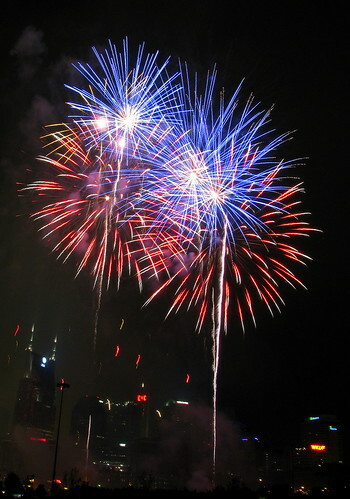 Want to see photos from in and around Rutherford County, TN? The most important photos can be seen HERE. Other counties can be chosen HERE. 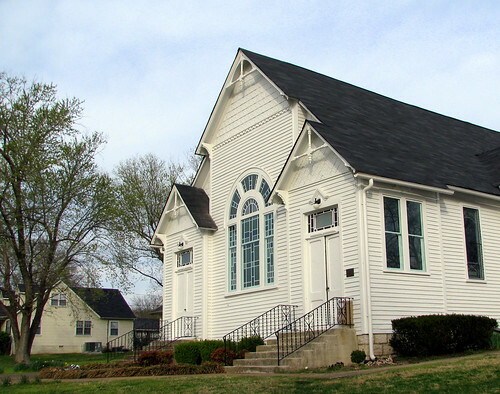 This congregations first building was built in 1849. 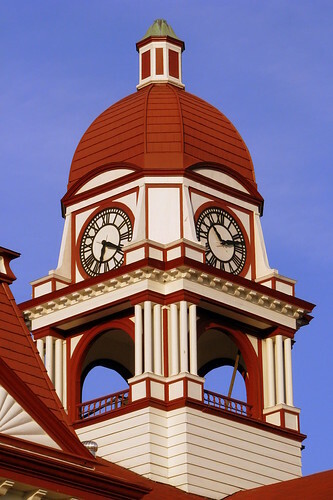 It was replaced with this one in 1888. 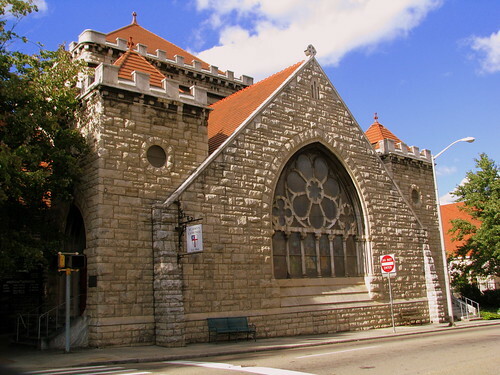 The frame church was constructed with an eclectic vernacular style and fine craftsmanship. The front remains virtually unchanged, although there are additions in the rear. Today, they are known as New School Presbyterian Church. 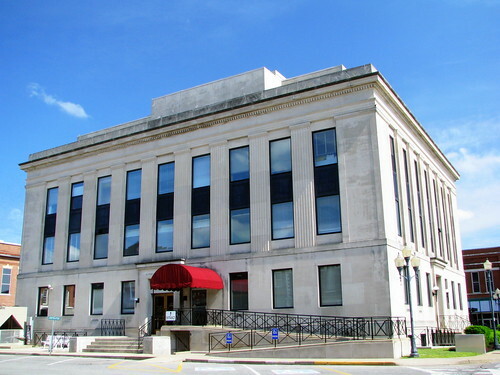 The building is on the National Register of Historic Places. What makes this one seem so unusual is how most of the wood along the bottom has disappeared with the rotting moving up to the middle. Yet, the wood that makes up the frame seems to be intact. There is some snow on the roof and a little on the ground. Seen somewhere in Marshall County, TN. 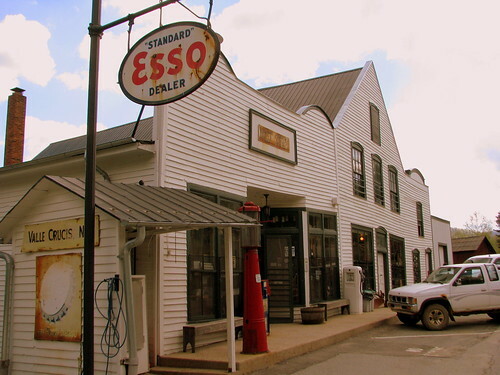 The Mast General Store, located in Historic Valle Crucis, is recognized by the National Register of Historic Places as one of the best remaining examples of an old country general store. It is still the center of the community housing the post office and offering coffee for 5¢ on the honor system. 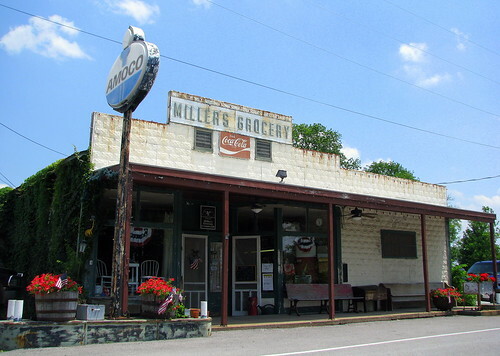 It remains true to the old-time general store from the 19th century by offering items that its neighbors might need, as well as products of interest to travelers and other visitors. The building that would become Mast General Store was constructed in 1882 by Henry Taylor and opened in 1883. W.W. Mast purchased half interest in the store in 1897, and the store was renamed the "Taylor and Mast General Store". 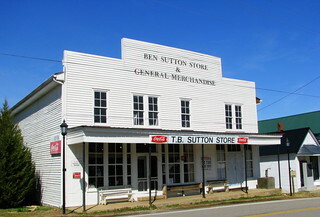 In 1913, Mast purchased the remaining half of Taylor's interest, and the business became known as the Mast General Store. The business stayed in the family through three generations until, in 1973, it was sold to a doctor from Atlanta and a professor from Appalachian State University. The business closed its doors in 1977. It would remain closed until John and Faye Cooper purchased and reopened it in June 1980. 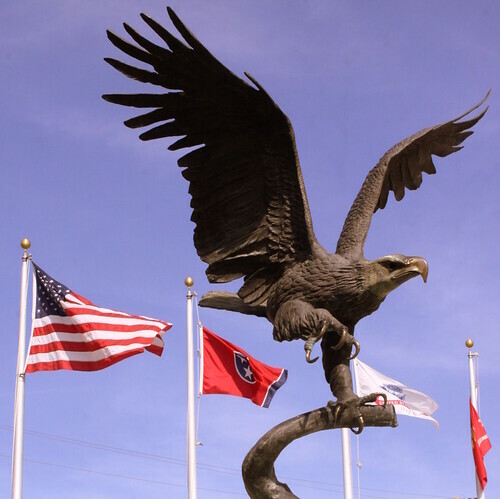 In 1996, Mast General Store became an employee-owned company. In the last couple of decades, the store has expanded with new locations including one in Knoxville. 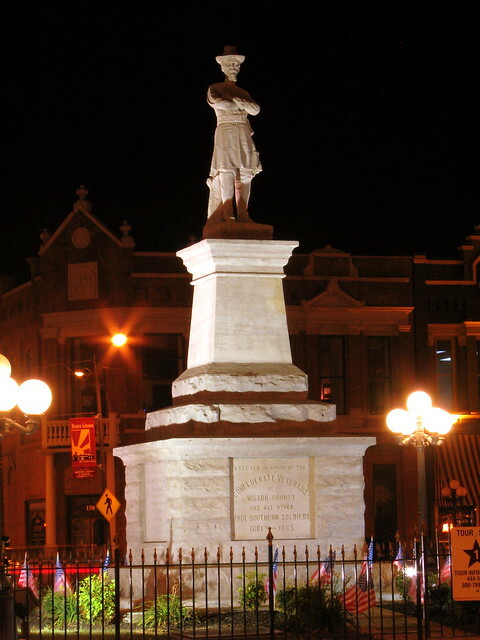 Located in Lebanon's town square is this monument to Civil War Confederate General Robert Hatton. Proof that New Rock City barns get painted. There's a couple of things that are rare about this rock city barn. 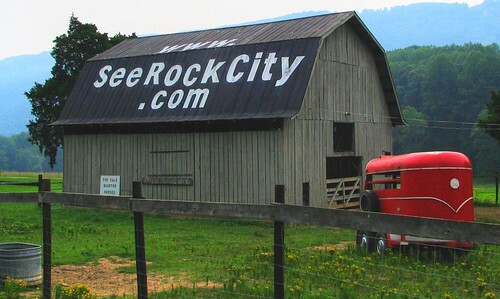 First of all, it gives off the Rock City website address, and that would only happen on a rather new barn. Secondly, this barn is in the middle of nowhere. 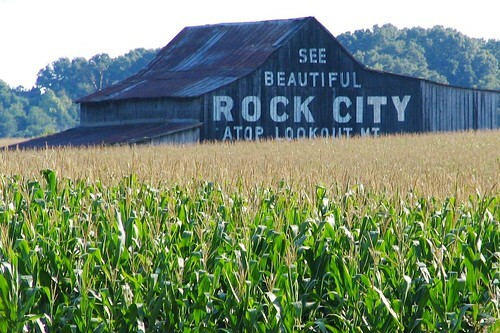 Most of the Rock City barns are located along what used to be major highways or at least near a tourist destination. This one is along a rural road in Dade County, GA along Pope Creek Rd. I guess the owner of this barn must work there, or at least know somebody. I'll admit that I am not fully happy with this photo, as it was completely cloudy that morning. I did something that I usually don't do much, and that is to tinker with the photo. Most of my basic image editing can be done in Picasa or MS Paint (don't laugh! ), but on this one, I tried my best with Gimp and Photomatix (This is an HDR.) I really wanted the red of the horse trailer and the green of the grass to stand out. As an alternate, I also tried the same photo with giving it an "old timey" feel ironically, and I'm torn between which version I like better. In this version, I really upped the brightness, because I think that makes the paint job look fresh. In the first photo, you can tell where some of the paint has started to wear off, especially on the Y. 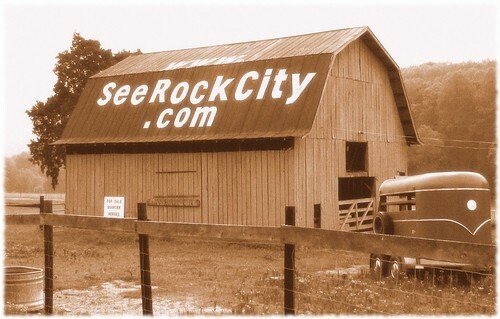 Most vintage Rock City barn photos in the 40's show the barn just after it was painted. 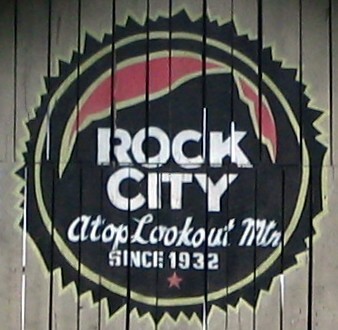 Clark Byers would take a photo of his freshly painted barn and send it to the Carter's, original owners of Rock City, as proof of the job. I also enjoy the irony, since this fake vintage feel would be an anachronism with a website address. Another thing that sets this barn apart is the modern Rock City logo painted on the side, which is something I've never seen on the other barns. 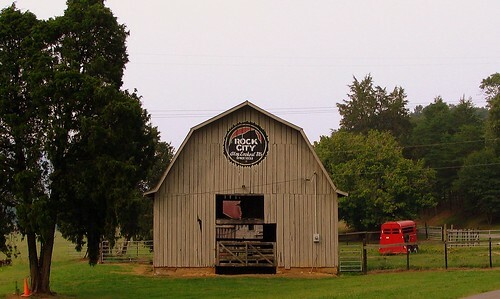 This is now one of 82 different Rock City Barns I have photographed and uploaded to Flickr in my Rock City Barns set. People often ask me how I've found so many of them. I have drawn from many resources such as books and web sites and sometimes luck, but there's not really one "go to" place to find them all. Well, now on my website, I have tried to create a one stop source for the locations of all of the barns I've been to. On my Map of Rock City Barns page, I have plotted each barn on a Google Map. This bridge was originally built by the L&N Railroad at a different location. In 1902, the railroad offered the bridge to the city of Corbin, where it was used for automobile traffic over Lynn Camp Creek for Engineer Street. 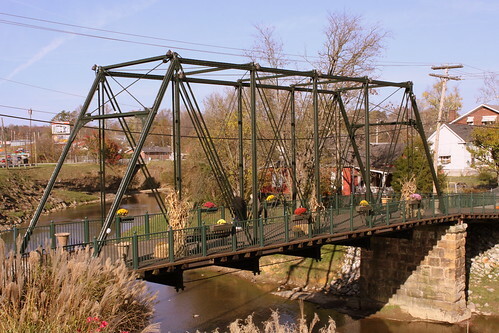 It was one of only two bridges in Kentucky that was a Pratt through truss with Phoenix columns as it was built by the Phoenix Iron Co. In the early 1990's when the bridge was quite structurally deficient, it was closed to traffic. Since it was added to the National Register of Historic Places, the town wanted to save the bridge. Today, it has been rehabilitated as a pedestrian bridge as part of a city park. Craighead Caverns is an extensive cave system located in Sweetwater, Tennessee. It is best known for containing the United States' largest and the world's second largest non-subglacial underground lake, The Lost Sea. In addition to the lake, the caverns contain an abundance of crystal clusters called anthodites, stalactites, stalagmites and a waterfall. The lake was discovered in 1905 by a thirteen-year-old boy named Ben Sands. 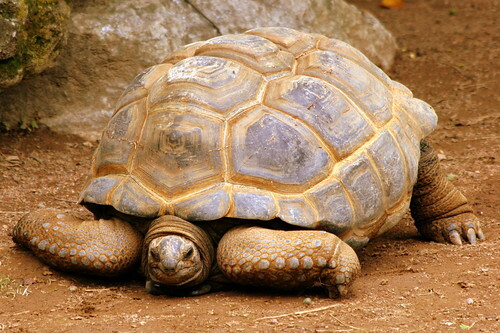 As the story goes Sands, who often played in the cave, happened upon a small opening and crawled through. The room was so large he was unable to see the ends of the room with his lantern, so he threw balls of mud in all directions and heard splashes. When he went back home and told people of his discovery they were hesitant to believe him. By the time Ben convinced his father to go back down with him to explore it further, the water level had risen, hiding the cave entrance from them. It was rediscovered by local explorers several years later. The visible surface of the lake measures 800 feet long and 220 feet wide (4.5 acres) at normal "full" capacity. Cave divers have explored several rooms that are completely filled with water, without reaching the end of the cave. This exploration was conducted in the 1970s. For many years The Lost Sea was considered the world's largest underground lake and is still recognized as the world's second largest non-subglacial underground lake after Dragon's Breath Cave, Namibia. Boat tours of the lake are still given and for many people are the highlight of the tour. In times of extreme drought (such as 2007-08) the lake recedes significantly and the management had to extend the walkway and the boat dock in order to be able to provide the boat tours. According to the management of the Lost Sea, the water level in the lake dropped 28 feet below its normal level at the height of the drought. 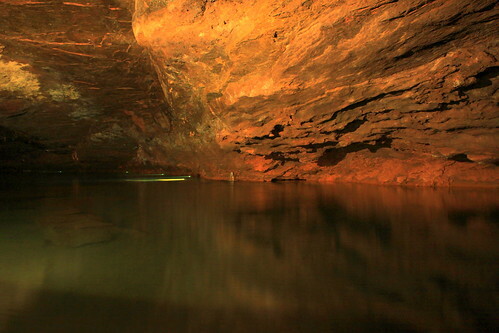 At such times visitors see a much larger cavern above the lake surface. There are also Rainbow Trout in the lake. They aren't native to the Lost Sea, but were added to the lake decades ago in an attempt to see how big the lake was. (It didn't work.) The tour guide has fish food which is thrown to the trout as part of the tour with the glass bottom boat. These fish have also lost much of their color from being in a cave for so long. This congregation was organized on May 1844 by Thomas W. Humes who later became the President of UT. About a year later, James Otey visited and laid the cornerstone for the original church building at the corner of Cumberland and Walnut. In 1892 at the same location, it was replaced by this stone building of Romanesque architecture. 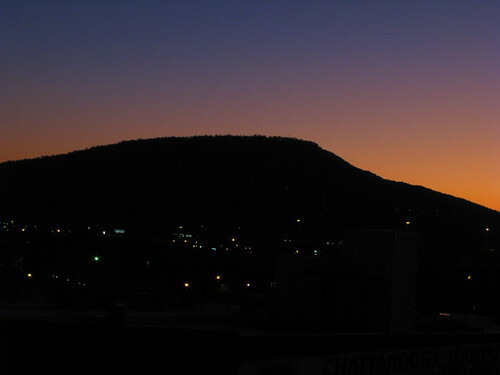 This view of the iconic mountain at Chattanooga was taken on night from the parking garage next door to the Chattanooga Choo Choo. 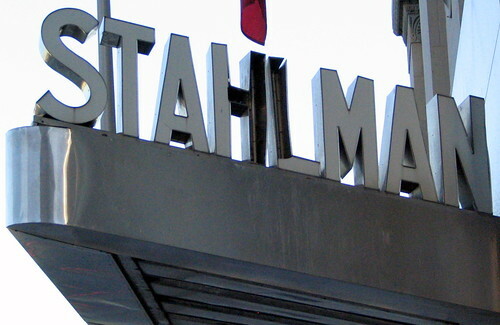 The steel sign that used to be above the entrance to the Stahlman Building in Downtown Nashville. 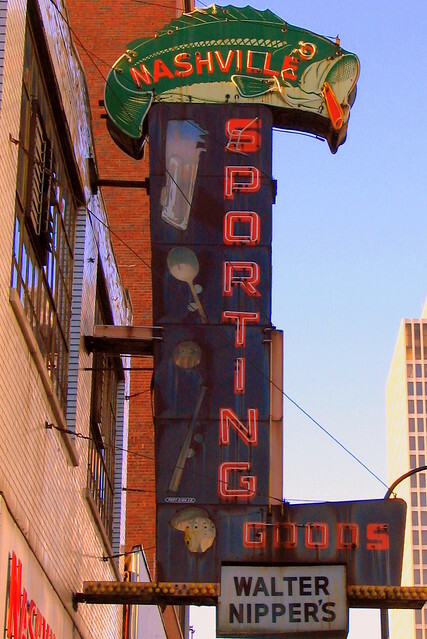 This Art Deco sign was removed after the building underwent renovation to become condos. 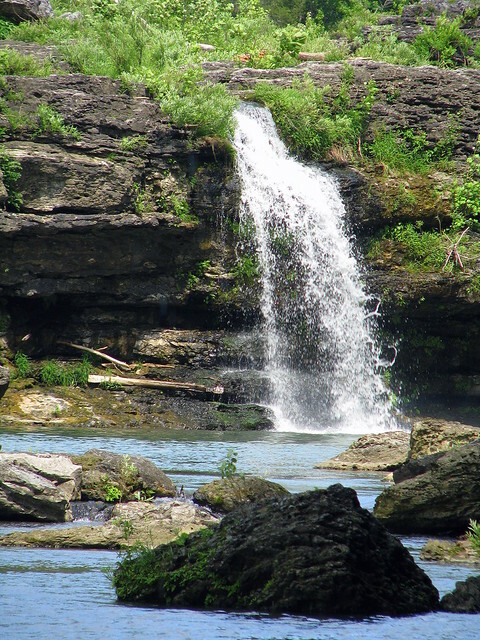 At Rock Island State Park, the widest cataract waterfall in TN works it's way over and around bedrock slabs along a 750 foot segment of the Caney Fork River resulting in multiple falls. This is a segment of the area and falls about 20 feet. From the parking lot, a trail leads below and one can crawl and splash around, depending on the recent rainfall. This was called Horseshoe Falls in the 1800s. One of the cuter entries in the Creative Arts building, this has got to be one of my favorite things I've seen submitted at the state fair. 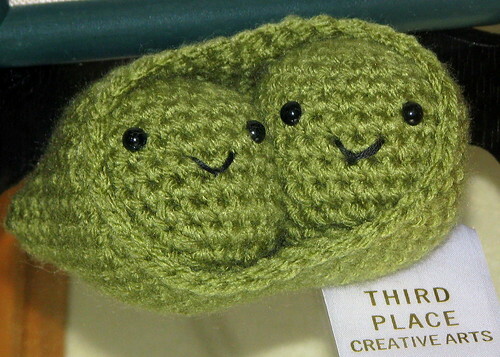 I even have a few people I know that are so close to each other, I've sent them this picture. 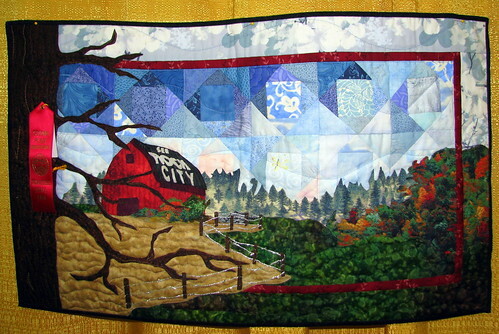 This was seen at the 2009 Tennessee State Fair. This is no longer an Amoco or even a gas station. It's not really a grocery store, either. Instead, today it is a popular restaurant and probably the only reason that people from out of town come to Christiana. A couple of years after I took this photo, I noticed this sign had been taken down as Walter Nipper's has been closed for a little while. At the time I took the photo, I was never quite happy with it as most of the sign is in a shadow, but now I'll never get another chance to improve on it. Instead at the time, I uploaded a picture of just the Fish with Nashville on it. I suppose I feel like I'm in a hurry to find as many old time neon signs and Rock City Barns as you never know when they'll be gone. Not far from the center of town is a small park with a couple of train cars underneath a small shed. 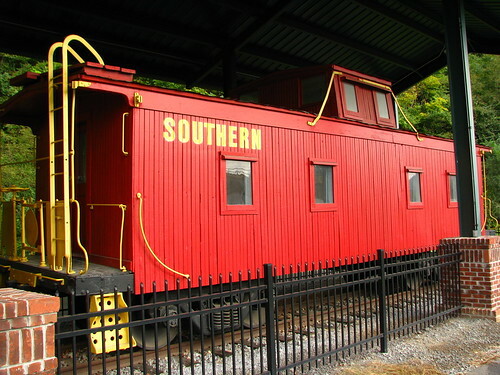 Southern went through E-ton from 1911-1940. Sign behind one of the columns: Suttons Ole Time Music Hour. Every Saturday at 6:00 pm. Still open for business, the weekly radio show is still really popular with the locals. 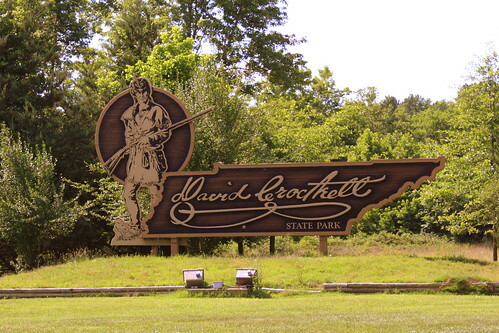 Not to be confused with Davy Crockett Birthplace state park in East Tennessee, David Crockett State Park is in Lawrenceburg, TN. 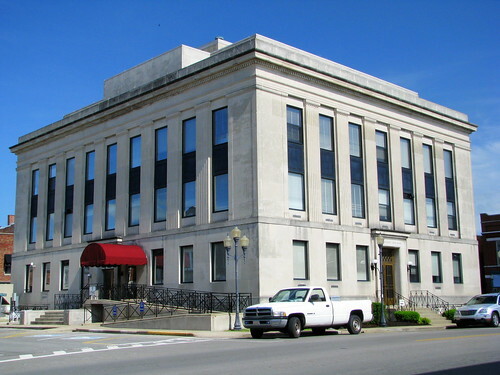 In 1817, Crockett moved to Lawrenceburg. Along the banks of Shoal Creek, he established a powdermill, a gristmill and a distillery. A flood in September 1821 washed away all three of these businesses and Crockett decided to move out west. Today, that land along Shoal Creek is the State Park with the entrance along US64. 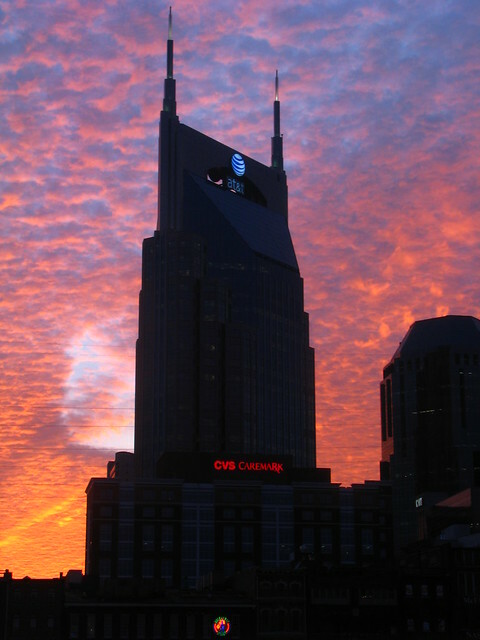 Near the beginning of 2008, Nashville's most prominent skyscraper, the Bellsouth Building had been renamed and re-logoed the At&T building. With the two spires at top, it has been locally dubbed as the Batbuilding. Maybe I'll call it the Bat&tbuilding. This is Nashville's tallest skyscraper at 617 ft and 33 floors. It was built in 1994. Another logo in this view has changed about the same time as the at&t logo. The Red CVS Caremark was just a white Caremark. 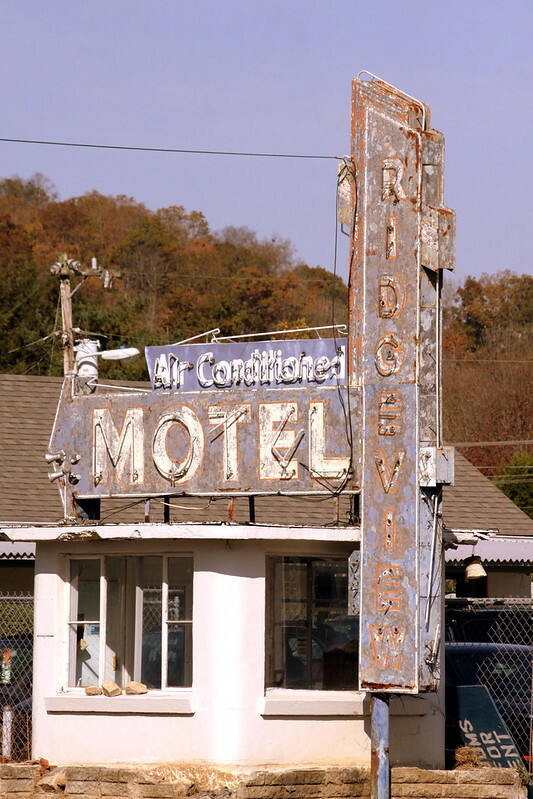 This still operational independent motel with it's vintage albeit crusty neon sign is seen along highway US25W in Clinton, TN. To the right of the V in RidgeView is the NO for No Vacancy. They say you can see 7 states from Rock City. It's a claim that is highly debated, especially by geologists that say the curvature of the earth would prevent seeing Kentucky (or Virginia) across the entire state of Tennessee. 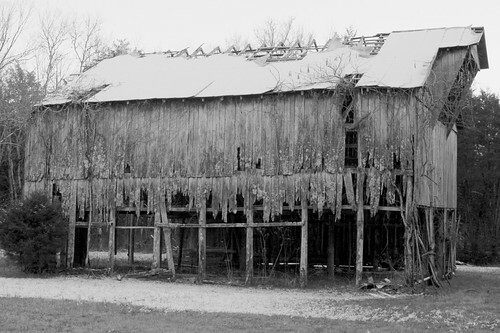 This post focuses an unusual state border irregularity between Kentucky and Tennessee and this barn which is just a stones throw away on the Kentucky side. As you can tell, the primary crop here is corn. If Geddes, KY is on your map, that is where this barn is located. It's in Simpson Co. Ky. on highway U.S. 31W, one of the 2 primary routes from Louisville to Nashville. It's also south of Bowling Green, KY and Franklin, KY. The other side of the farm is lines with trees and on the other side of the trees is Interstate 65. If you were to take I-65 across the border to KY exit #2 and were to drive 1/4 of a mile, you'd be here. This barn is about 1 mile from the Tennessee state line, and if it weren't for an unusual border irregularity it would be closer to only 1/2 a mile from the state border. This border jag has an interesting history of its own. In the 1780's, in the early days of the country, Daniel Smith was hired by the state of Virginia to survey the border between them and North Carolina. At this time, Kentucky was part of the Virginia territory and Tennessee was part of North Carolina. When Smith's party reached this spot, the equipment began to malfunction and they stopped bearing due west. When they learned of their mistake, instead of backtracking, they compensated for the mistake by heading northwest until they were back on course at the correct latitude. Their survey was submitted like this and it was approved. Several years passed and both states of Tennessee and Kentucky had come into existence, and it was the first time anyone noticed the jagged border. Both states claimed ownership of the land. Sanford Duncan was a prominent landowner, owning farmland through much of this area. He built a stagecoach inn in this land in 1819, and much of it still stands today. Three more surveying groups came to the area to again determine the state line, which wasn't fully settled until 1831. One version of the story goes that the third group of surveyors stayed at the Sanford Duncan Inn, and he wanted his land to stay in Kentucky. On the night they stayed, he filled them with whiskey and begged the land to remain at it was. In the intervening years, it was difficult to determine who had jurisdiction over this area, known as Linkumpinch. 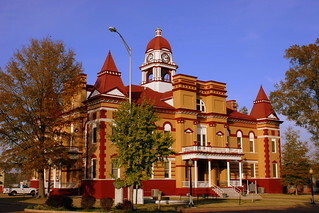 This made the area popular for duels (and the Sanford Duncan Inn became the most popular place to stay). 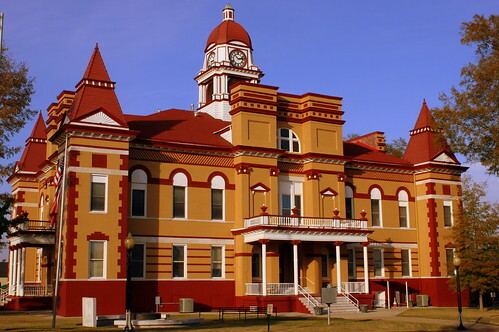 Dueling was illegal in both states, and willing participants would come here telling any law enforcement that the other state would have to intervene. The most famous one was in 1826 when Sam Houston (who had trained with a pre-president Andrew Jackson) defeated General William White. In 1827, a duel between two Clarksville, TN lawyers garnered so much bad publicity that both states finally came together to jointly enforce the rules here. To this day, anyone who takes public office in Kentucky has to, as part of their oath, promise to have never participated in or organized a duel. In the 50's, on the same land, the Highway 31-W Drive-in Theater opened up, and is still there today. Across the street, in 1990 the Dueling Grounds Race Course opened up hope to lure Nashvillians who wanted to legally gamble, and bet on horses. The track has fallen on hard times but is also still around, now known as Kentucky Downs. Today we're venturing way outside of Tennessee for a story. 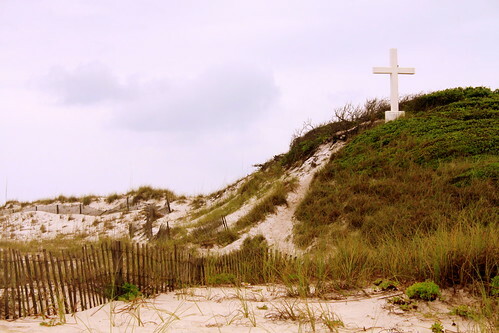 This cross marks the site of the first religious service in the Pensacola area, which was a mass celebrated on Aug. 15, 1559 here at Santa Rosa Island. It was the Feast of the Assumption by the Dominican Friars who accompanied Tristan De Luna. In Downtown Nashville, two buildings along Union St. This view is from the observation deck in front of the courthouse. 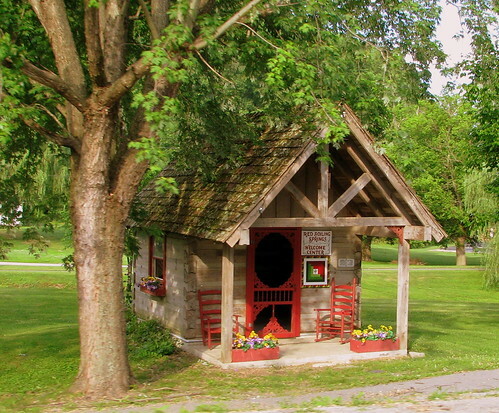 This cute little building is located along the main road (highway TN 151) that connects the center of the small town with all of the historic hotels. On this Independence Day, I'd like to remember those who fought for our freedom. 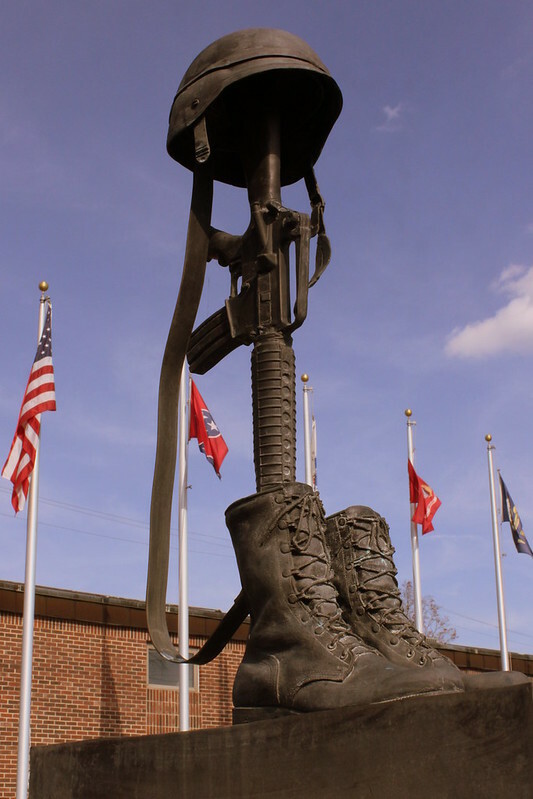 Seen here is the Campbell County Veterans Memorial in Jacksboro, TN. 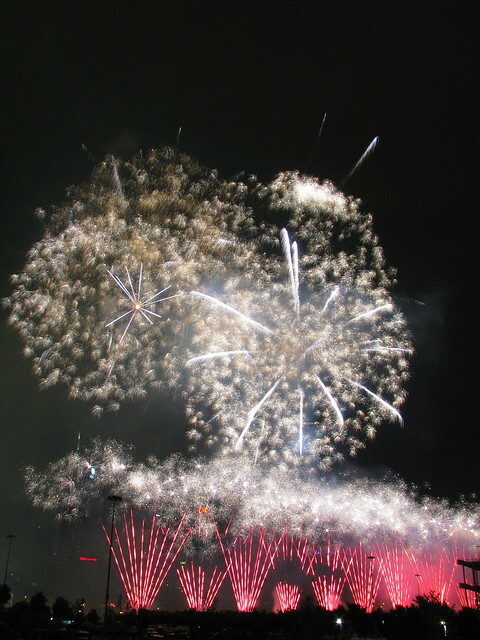 Are you making plans for Fireworks? 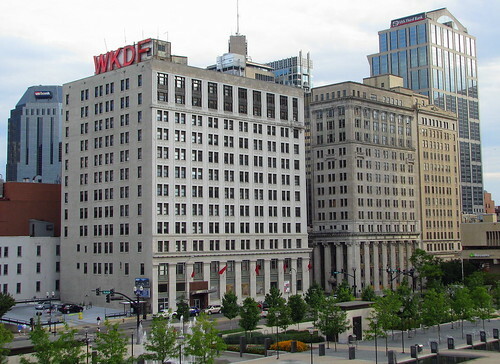 Here are some photos taken in downtown Nashville in 2008. 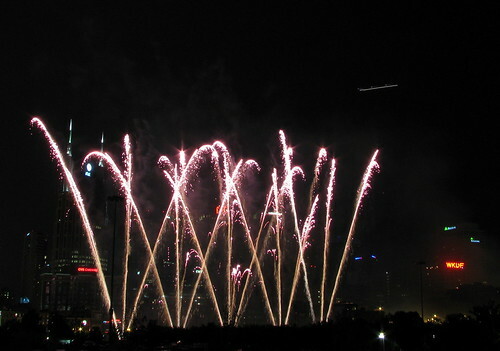 As you know, Independence Day is coming up this week! This is seen at the Coolidge Park Carousel along the riverfront near downtown Chattanooga. 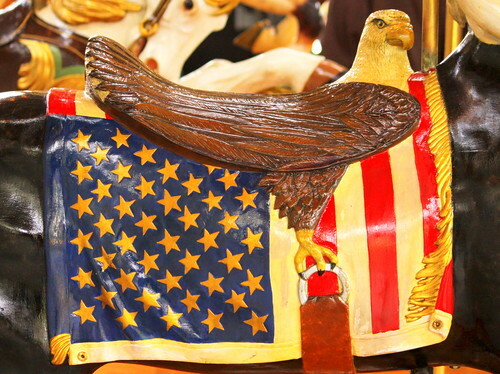 For this carousel, they took a 115+ year old Detzel frame carousel and built 52 whimsical new seats for it. Each seat was well done with great attention to detail. Much of the work was done by Bud Ellis at Horsing Around studio with a team of talented craftspeople. The "Friends of the Carousel" spent 10 years on their labor of love meticulously transforming the old carousel remains which had been in storage for many years. See more photos of the carousel and other things at Coolidge Park in this set.